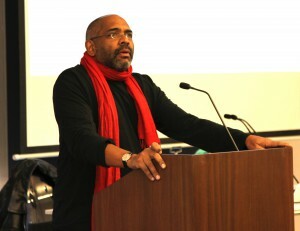 “The Caribbean is preparing the future,” said David Scott, Professor of Anthropology, Columbia University, as he introduced the second installment of “The Caribbean Digital,” a conference organized by CSSD’s Digital Black Atlantic working group. Focused on “Histories, Cartographies, Narratives,” the daylong event on the Columbia campus began with Scott’s recollection of a conversation with the Cuban intellectual Roberto Fernandez Retamar about the promising nature of fieldwork centered on communications within and about the Caribbean region. “He didn’t say ‘our future’ or ‘its future’—he said ‘the future,’” clarified Scott. Presenters proceeded to consider how Caribbean communication networks were global and experimental long before the advent of the Internet and other technologies. Participants also explained how the region poses unique challenges and opportunities for the digital era. For the “Histories” panel Vincent Brown, Professor of History, African, and African American Studies, Harvard University, presented his interactive website documenting the research amassed in Richard S. Dunn’s A Tale of Two Plantations: Slave Life and Labor in Jamaica and Virginia. Tracking the lives of more than 400 enslaved individuals—an unprecedented trove of genealogical information—the website foregoes the format of the family tree in favor of visualizations that emphasize belonging and connection across generations and between plantations. Brown ultimately offered a critique of the family tree as a technology first designed to track royal blood and organize patriarchal patterns of inheriting property. Recognizing these limits, Brown advocated for experimentation with new ways to represent the bonds between people who were property and whose families were regularly disrupted by early death and sudden sale. Laurent Dubois, Professor of History, Duke University and Mary C. Lingold, English doctoral candidate, Duke University, also emphasized the interpretive innovation required to “read” even a single historical document: in this case, Hans Sloane’s transcription of three songs for banjo and percussion performed by Africans in Jamaica in 1688. Though much information is missing in the musical notation, Dubois and Lingold have carefully reconstructed and recorded versions of what these songs might have sounded like, bringing to life the sensory world of late seventeenth-century plantation society. Dubois and Lingold argued against the common misconception that digital humanities projects always aim to “do more, faster;” their project instead promotes the time-honored practice of close reading, deepened by new tools. For the panel on “Cartographies,” Alex Gil, Affiliate Faculty, English and Comparative Literature, Columbia University and Kaiama Glover, Associate Professor of French, Barnard College, continued the theme of collaboration in both method and material. The pair’s joint project-in-progress, “In the Same Boats,” will eventually track the overlapping trajectories of African diasporic intellectuals as they crisscross the Atlantic. Originally inspired by the travels of Rene Depestre to Cuba, Haiti, and Czechoslovakia, Professor Glover conceived of a multimedia platform that would allow her to visualize his intersections in space and time with other migratory artists like Langston Hughes, Josephine Baker, and Alejo Carpentier. Too often, these connections are obscured by the academy’s departmental model, which segregates French, Spanish, English, and Portuguese departments from one another. Gil and Glover acknowledged that they have a long way to go in realizing their vision, but emphasized the importance of sharing the experimental process behind digital projects. Gil steered the conversation towards the audience and the longevity of digital projects. Building sites using “minimal computing” makes data available even where Internet service is unreliable and helps sites remain flexible as technologies change. Digital projects have the potential to model democratic ethics for scholarly work, even as they demand new skills and more—not less—labor than analog investigations. The final panel, “Narratives,” consisted of a conversation between the Caribbean artists Robert Antoni and Oonya Kempadoo, moderated by Kelly Baker Josephs, Professor of English, York College/CUNY. Antoni’s project is a digital companion to his most recent novel, As Flies to Whatless Boys, supplementing the traditionally fixed space of the text with dreamlike video sequences. Kempadoo’s project, Naniki, exists wholly online, utilizing the multi-dimensionality of the digital space to form a speculative narrative that raises questions about Caribbean sustainability. The diverse projects highlighted by the conference prove that digitization—and the quantitative data analysis that makes it possible—does not have to mean scholarship without affect, or history without politics. Learning to use new tools actually gives us the space to ask how the tools we use always condition the knowledge we produce and the stories we tell.